MultiTouch Action In android mobile software app Is one of the common action. Earlier we learn usage of TouchAction class In appium android software automation test to perform DRAG AND DROP and SWIPE ELEMENT. You also needs to automate multi touch action In your android mobile software app. Here I have demonstrated simple example on how to perform multi touch action In your android mobile softwareapp. We will use MultiTouch Tester software App In this android appium multi touch action automation test example. So you need to download and Install MultiTouch Tester android software App In your mobile device. You can download and Install MultiTouch Tester App from Google Play Store or THIS PAGE. We wants to perform multi touch at 5 different points at the same time on MultiTouch Tester App's screen as shown In bellow Image. This Is what we wants to achieve from this appium android test example. In above Image you can see that there are 5 points where we wants to perform MultiTouch Action In appium android automation test. You can get X Y Coordinates of all 5 touch points manually using uiautomatorviewer too as described In THIS POST. In our appium test, We will calculate X and Y Coordinates of all 5 touching points pragmatically by calculating screen's width and then will get different x and y points using size.width and size.height methods. Create new MultiTouch.java file under your project and copy paste bellow given test script Inside It. //Get X Y Coordinates for touch action 1(Top left side). //Get X Y Coordinates for touch action 2(Top right side). //Get X Y Coordinates for touch action 3(Bottom left side). //Get X Y Coordinates for touch action 4(Bottom right side). //Get X Y Coordinates for touch action 5(middle of the screen). // Create object of MultiTouchAction class. // Set touch action1 on given X Y Coordinates of screen. // Set touch action2 on given X Y Coordinates of screen. // Set touch action3 on given X Y Coordinates of screen. // Set touch action4 on given X Y Coordinates of screen. // Set touch action5 on given X Y Coordinates of screen. // Generate multi touch action chain using different actions and perform It. First of all we have collected X and Y coordinates(x1,y1, x2,y2, ..ect) for different touch point positions. 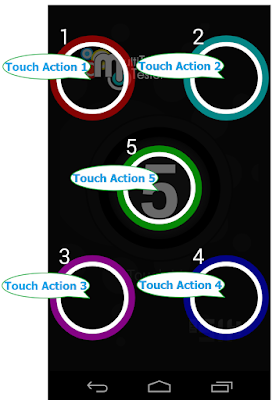 MultiTouchAction Is a class which provides us a facility to generate multi touch action chain using touch action chain. We have created touch action chain for all 5 touch points using TouchAction class. 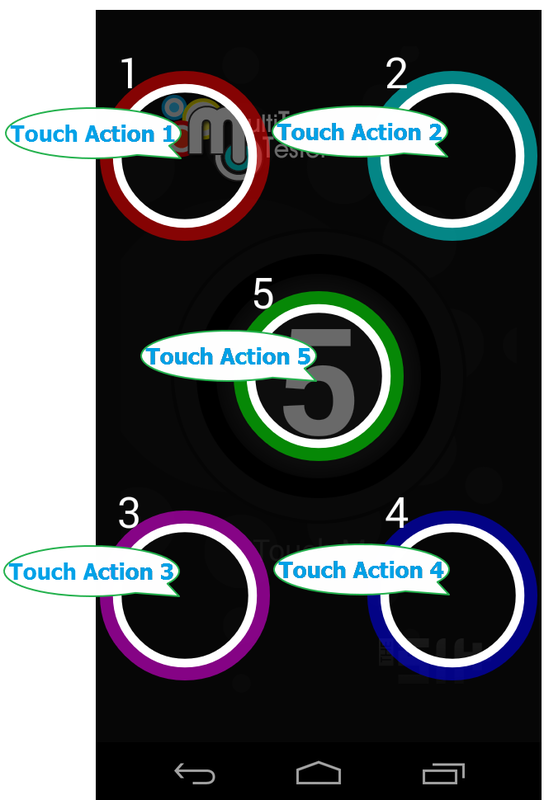 And then added all 5 touch actions In MultiTouchAction chain using .add(TouchAction action) method. perform() action will perform steps given In MultiTouchAction chain. Now you can run above test script In your android mobile device using appium and testng. It will launch MultiTouch Tester App In your android mobile device and then perform multitouch action.